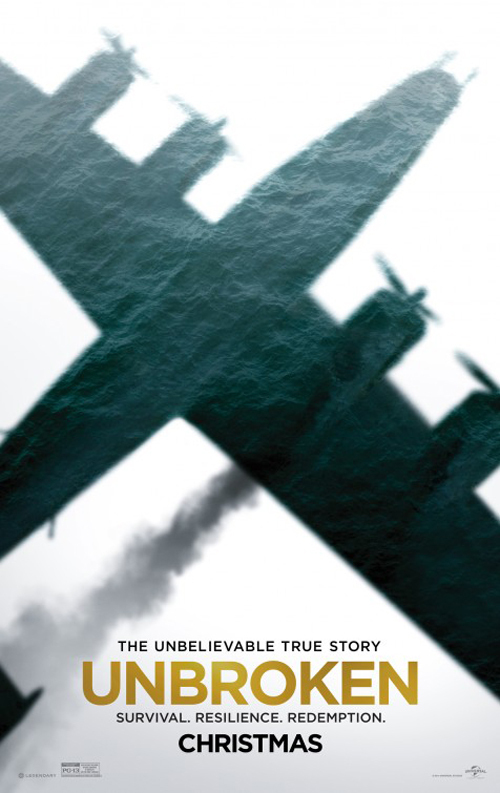 (SPOILERS) It’s easy to see why the life of Louis “Louie” Zamperini was snapped up as a movie property, since it sounds on the “too eventful a yarn to possibly be true” side. Competing (and winning bronze) in the 1938 Olympics, adrift for 45 days after his plane crashed and enduring hell in Japanese prison camps, surviving, marrying, suffering PTSD and financial woes before devoting his life to God as he promised he would, making peace with (most of) his oppressors and then at age 80 running with the Olympic torch in Tokyo. Except Angelina Jolie’s film Unbroken, from a screenplay by the Coen Brothers, Richard LaGravensese and William Nicholson, adapted from Laura Hillenbrand’s Unbroken: A World War II Story of Survival, Resilience, and Redemption, covers only the first three of these, and gets bogged down in the final one to such an extent that rather than exploring the man we only experience a surface reflection through his repeated tribulations. Unbroken covers the other details in a couple of sentences over the end credits, showing footage of the actual Louie with the torch. It rather begs the question, with a title like this, why the makers think they’ve done enough with his story. This is a long film, but it feels limited and constrained once it pitches into the prison camps before the halfway mark, where it remains. We have little idea of who Zampa is as a person, other than flashbacks showing him as a tearaway who could tearaway (there’s something pseudo-Forrest Gump about the sequence; “Run, Zampa run”, and what ten-year-old exclaims “I’m nothing, let me be nothing!”; talk about existential crisis). The flashbacks generally are inserted in the de rigueur manner that announces this will succumb to the problems most biopics do. In a sense, it stops short by finishing with the end of the war, whereas many a biopic will carry on regardless in a linear array of prosthetics, but there’s a balancing act necessary here that Unbroken can’t get right. Jack O’Connell’s crowning moment as Louie is designed as his raising, defiant, an unconvincing bit of prop wood over his head while malicious Japanese warden The Bird threatens to have him shot if he drops it. The music swells up at this Louie’s bravery and indomitability, but all one takes away from the scene is corniness. There’s a great deal of difference between a scene being factually correct (although this makes it look like he held the timber for half a day, rather than half an hour) and whether or not it translates to screen effectively. Perhaps Unbroken would have worked better as a mini-series? It bears the structural imprint of Nicholson, who provided determinedly un-mould breaking screenplays for Sir Dickie (king of the traditional – or dull, if you prefer – biopic). One can discern nothing of the Coens at all, which would be a triumphant disappearing act if the script’s quality were assured. The thing is, there’s half a good movie here. I found the adrift sequence – complete with machine-gunned shark – compelling in a way the Merry Christmas Mr Lawrence-lite internment ordeal wholly isn’t. Maybe part of this is that Louie isn’t a man in isolation; the absence is really felt when he is separated from Domhnall Gleeson’s Phil, the latter never to return. It feels like a clueless snub to audience investment in the character when we are told in the coda that Phil survived the war too and he and Louie became lifelong friends, as if the makers were oblivious to what was working and what wasn’t in the picture. Jolie as director has taken some hits, but her basic handling of the material is solid and sensitive, aided admirably by Roger Deakins’ cinematography (there is a bit too much gorgeous framing for something intended to be so arduous, perhaps). Alexandre Desplat, possibly the most variable composer winning Oscars today, lays it on with a trowel, and this is very much in the ill-advised war score category of Monuments Men. But he’s also responding to Jolie’s inability to hang back, her urge to over-varnish. I don’t know how many prisoners actually lined up to punch Louie in the face, but if it’s as many as depicted it’s a wonder he had any face left. During the aforementioned plank scene, Louie flashes to wondrous moments of running, and one can only think unintentional parody. Likewise, the unnecessary cut to the actual guy in 1998 is a Spielberg Saving Private Ryan move (albeit that was fictional), and as ill advised without the tissue that comes in between. Louie may not have wanted his conversion to be part of the picture, so as not to put unbelievers off, but what we end up with is this suffering being all the man is, without even much insight into him during that experience. It’s the one-note nature of the brutality endured by Louie at the behest of Miyavi’s “The Bird” Watanabe that sinks the picture. As noted, it’s not whether the essentials are true or not; it’s how they work dramatically. Miyavi is suitably unnerving, but he’s basically just a movie monster. No one else during this sequence makes much impression; Garrett Hedlund gives a decent enough showing in an underwritten role. As great as O’Connell has been in most things, he’s only ever okay here, and so glaringly not Italian looking you wonder why they even bothered trying to boot polish his hair and tan his skin. Jolie can definitely put an effective sequence together, as the first hour of the film shows, but she needs someone advising her against indulgence, the sort of indulgent that leads to Coldplay fogging over the closing credits. She shows considerable wisdom at times (Jai Courtney doesn’t make it beyond the plane landing in the drink) but Unbroken’s material required restraint, and more still a screenwriter who could inlay the man and not just his keynotes.